This coleslaw is a classic. Green cabbage, shredded carrots, creamy dressing. It's the perfect side for burgers and hotdogs at your next backyard party. This coleslaw is a classic. As in, the classic, with green cabbage, shredded carrots, and creamy dressing. If you're looking for a solid, dependable coleslaw that promises to play nice with all the burgers and hotdogs at your next backyard party, then here it is. 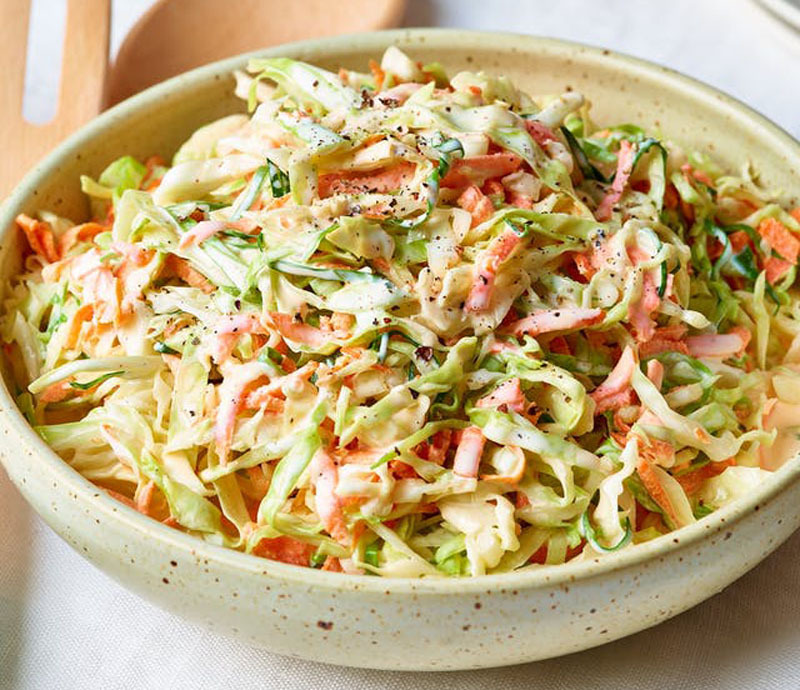 [post_ads]This diner-style coleslaw is the epitome of what a good slaw should be: green cabbage, a few carrots, and a good dressing. It's nothing flashy, but that's as it should be. 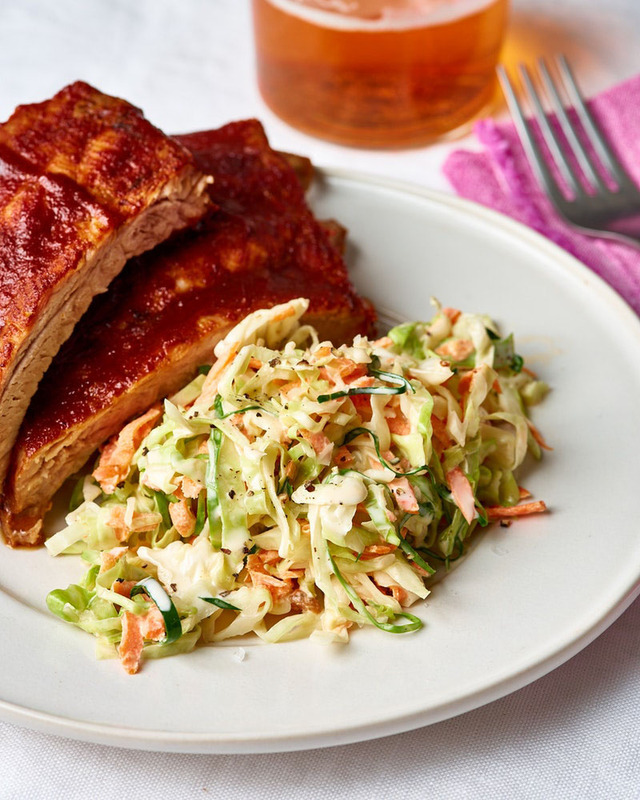 Slaw is the back-up dancer to flashy barbecue numbers. Its cool creaminess, crunchy texture, and tangy flavor balances out the richness of smoked and grilled meats. This said, I'm not opposed to the occasional riff. Throw in some red or purple cabbage alongside the green — that mix of colors is so very pretty on the plate. I've also been known to toss a few chopped celery stalks or some bell peppers in there. Anything crunchy and fresh will only make the coleslaw better. Mayonnaise dressing: Makes a richer, slightly sweeter dressing. Buttermilk dressing: Makes a lighter, tarter dressing. Sour cream dressing: Makes for a rich and tangy dressing. All three are typically cut with some vinegar — either white wine vinegar or cider vinegar is great — along with a little sugar and salt. I'm a buttermilk girl, personally, but I respect other coleslaw choices. I also respect the addition of other flavorful things — a spoonful of mustard, a sprinkle of celery seeds, a bit of grated onion. Sure! Start with one of the three dressings as a base and dress it up however you like. [post_ads]Freshly made coleslaw tends to be at its crunchiest, creamiest best if eaten on the day its made. The longer it sits, either on a picnic table or in the refrigerator overnight, the more liquid is released from the shredded cabbage, which can make the salad overly wet and soggy. If you're hoping to make the slaw a day or two ahead, I'd suggest prepping the cabbage and carrots, and then storing them, undressed, in a container in the fridge until you need them. The dressing can be made in a mason jar or other small container; when you're ready to assemble the salad, just shake up the jar and pour. There's one other option, too: salting the cabbage. This seems counterintuitive since salting the cabbage causes it to wilt, so this requires some trust. Once squeezed of liquid and mixed with the carrots and the dressing, the texture of the cabbage is actually quite crunchy, and the salad itself will keep for several days. Give the coleslaw about an hour to chill in the fridge before you serve it. This gives the flavors time to mingle and relax into each other. For that extra little kiss of coleslaw goodness, save a little bit of the dressing and drizzle it over the slaw just before serving. Shred the cabbage. Halve the cabbage through the core and peel off and discard a few of the thin outer layers. Cut each half into quarters, then cut out the tough core in the middle. Slice each quarter crosswise into thin shreds, or run the quarters through a food processor with a shredding blade. Transfer the shredded cabbage to a large bowl. Salt the cabbage (optional). Salting the cabbage helps it stay crisp a little longer if you're making the coleslaw ahead. Transfer the cabbage to colander and toss it with a tablespoon of salt. Let stand on a plate or in the sink for an hour or two. Squeeze as much moisture as you can from the cabbage, then continue making the coleslaw. Shred the carrots. Peel the carrots, then either cut them into very small matchsticks, or shred them using a food processor with a shredding blade or on a box grater. Add to the bowl with the cabbage and toss to combine. Make the dressing. Place all the dressing ingredients in a small bowl and whisk to combine. Taste and season with more salt, sugar, or vinegar as needed. Refrigerate for at least 1 hour before serving. Coleslaw has the best texture and flavor the day it's made, but it still keeps well for several days in the fridge. If you're making this coleslaw more than a day ahead, don't skip the salting step above. For extra creaminess, drizzle a little reserved dressing over the top of the slaw, or fold an extra spoonful of mayo into the slaw just before serving. Storage: Leftovers can be refrigerated in an airtight container for up to 3 days.